There were 2 posts published on April 14, 2019. Albert Einstein’s Letter on Earth’s Shifting Crust with ORIGINAL HANDWRITTEN Diagram, Equations and Annotations plus Typed Letter Signed A. Einstein, one page, 8.5 x 11, blindstamped Princeton letterhead, January 16, 1954. Charles Hapgood, enclosing a carbon copy of a letter he wrote to Mr. Of Geology and Mineralogy at the University of Massachusetts, on Hapgood’s theory of earth crust displacement. 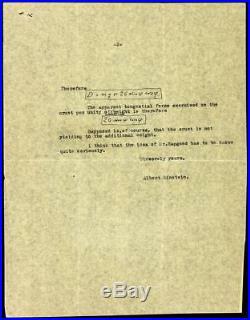 ” Includes the two-page carbon copy enclosure, an unsigned typed letter by Einstein which bears several handwritten annotations, including: an original hand-drawn diagram, three original handwritten equations, a term representing tangential force, and five original handwritten anglesthree for “beta” and two for “phi, as well as one holograph word, all by Einstein. Einstein’s letter to Farrington begins, in part: When I read your letterI too hadthe impression that I had overestimated erroneously the dislocating force on the solid crust due to an additional (eccentrically located) mass. More careful consideration has shown me, however, that, paradoxically, your argument is not conclusive. ” Einstein explains: “We imagine the rotating earth with’frozen’ crust. The surface of the crust is then (with reference to the rotating earth) and equipotential surface. If one places excentrically a’small’ sphere of the mass m on this surfacethen this sphere is in equilibrium. ” He draws a diagram to the left, and continues: “One feels therefore induced to believe that for this reason no angular momentum could be produced on the crust by this sphere. Such conclusion would be, however, invalid as shown by the following consideration. ” He goes on to illustrate his point using mathematical equations, and concludes: “I think that the idea of Mr. Hapgood has to be taken quite seriously. Einstein wrote the foreword to Hapgood’s book, The Earth’s Shifting Crust, published by Pantheon Books in 1958. Hapgood’s book denied the existence of continental drift, speculating that the ice mass at one or both poles over-accumulates and destabilizes the Earth’s rotational balance, causing slippage of all or much of Earth’s outer crust around the Earth’s core, which retains its axial orientation. 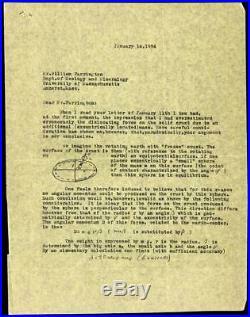 A spectacular scientific letter by Einstein. 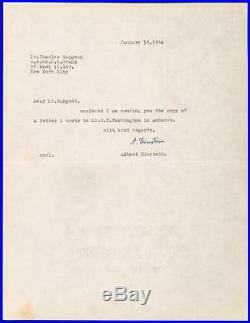 This is the ONLY Einstein’s letter on Earth’s Shifting Crust in private hands. The item “Albert Einstein Letter Signed with Original Handwritten Equations & Diagrams” is in sale since Friday, April 5, 2019. This item is in the category “Collectibles\Autographs\Science, Inventor”. The seller is “collectibles*101*” and is located in Cherry Hill, New Jersey. This item can be shipped to United States. Ernst August Prince of Hanover. Hereditary Prince of Brunswick, Prince of Hanover – head of the House of Hanover from 1953 until his death. Typed letter signed, one page, 5,5 x 7,25 inch, Castle Marienburg, 12.02.1948, in German, to Mrs. Von Schneider-Egestorf – Prince Ernest Augustus of Hanover thanks his correspondent for birthday greetings, signed in dark ink “Ernst August”, attractively mounted (removable) for fine display with a photograph, shows Ernst August in a beautiful portrait in uniform (altogether 11,75 x 8,25 inch), with a central horizontal letter fold and very mild signs of wear – in fine to very fine condition. Für Ihre freundlichen Glückwünsche zu meinem Geburtstage spreche ich Ihnen meinen herzlichsten Dank aus. Our Identification Number: 6018816. Satisfaction Guarantee – If you are not satisfied with the autographs you can return them within 15 days without giving reasons. We do not offer any Autopen-, Secretarial-, Stamped- or Pre-Print autographs. Certificate of Authenticy – We stand 100% behind all the signatures that we offer! You will receive each autograph with a fine certificate of authenticity with a unique identification number. This service is to our knowledge unique, as illustrated certificates only bring a proof of origin in case of emergency. All prices include VAT. We are unable to accept any foreign cheques. You will receive your order securely packaged and presented neatly within a few days. Please do a google research for “brandesautographs” 2. In our autograph advice guide we will endeavour to answer the questions that we are most often asked on the subject of autographs. Now take some time to read this sections; advice that will help you to keep long and respectful you for autographs! Take a look to our Feedback and Testimonials 5. We are in business for autographs for more than 25years and maybe have Europeans largest reference library in this field. Markus Brandes is passionate in collecting autographs and manuscripts for more than 25 years and since 1997 Markus Brandes Autographs serves worldwide the needs of clients and stands for high class authentic signatures in all areas. If you have any questions or suggestions, drop us a line as we love hearing from our customers. 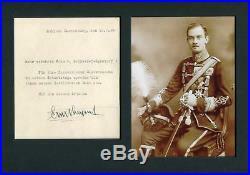 The item “Prince Ernest Augustus of Hanover autograph, handwritten letter signed” is in sale since Monday, March 5, 2018. This item is in the category “Collectibles\Autographs\Political\Other Political Autographs”. The seller is “brandesautographs” and is located in Kesswil. This item can be shipped worldwide.